Have you got a grunter? 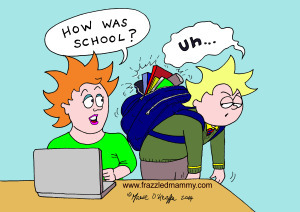 Last week I spoke to PJ Coogan on Cork’s 96FM’s Opinion Line about how the kids are coping with being back at school. How do we know if all is well? Will they tell us? Are you, like me, one of those parents who ask their kids when they come in the door “How was school?” or “Howja get on today?” I usually get a grunt – “Uh,” maybe followed by “Alright.” I’d keel over with the shock if this pithy exchange led to a proper, actual conversation. In fairness, it’s the fourteen year-old boy who engages in the Neanderthal-like mumble. His younger brother will volunteer a bit more – maybe tell me what the teachers are like, while daughter in 5th year will discuss her subjects, partly to tease out that she’s made the right choices for Leaving Cert. The radio talk turned to “Would he tell you if there’s a problem?” I don’t know. Would my young teen really tell me if he was anxious about something? I’d hope so. Another mother had said she didn’t care who her child spoke to – granddad, friend or whoever, so long as he had someone to confide in. I guess all we can do, as parents, is keep an eye and ear open, and hopefully pick up on anything out of the ordinary. And be aware of the company they keep, like that old saying “Show me your friends and I’ll show you who you are.” After all, we can’t waterboard or physically force them to tell us stuff! Teenagers don’t like us fussing or interfering. Or, God forbid, be seen in public with their parent. As time goes by, I realise I’m becoming more like my mother. The day (or rather, night) may come when I’ll be the one lying awake, as Mam did, waiting for the door to creak as her kids snuck home from the disco. Tweens can be similarly indignant. PJ shared that one time when his young daughter went on a sleepover, she did NOT want her mum ringing to check all was OK – totally uncool! However, mum did – only to get the cursory “Alright” grunt. No matter. Regardless of their age, whether coming home from school, disco or sleepover, a grunt is good! This entry was posted in Parenthood and tagged Cartoonist, Cork, Illustrator, Ireland, Maeve O'Keeffe on September 11, 2014 by frazzledmammy.